A dramatic qualifying session ahead of the Chinese Grand Prix saw mixed fortunes for the Mercedes team. Lewis Hamilton suffered an engine problem that meant he couldn’t set a time in the first session, but he was joined by Pascal Wehrlein who also didn’t complete Q1 after knocking his Manor car against the barriers. Both Renault drivers were out in Q1, along with Esteban Gutiérrez. Fellow Haas driver Romain Grosjean sneaked into Q2, and managed 14th place ahead of two Saubers. Nico Hülkenberg’s Force India was released at the end of Q2 with a tyre not attached, which halted most of the drivers who were on a fast lap. Alonso and Button finished 11th and 12th, but both were disappointed, thinking they could get their McLarens into the top ten. 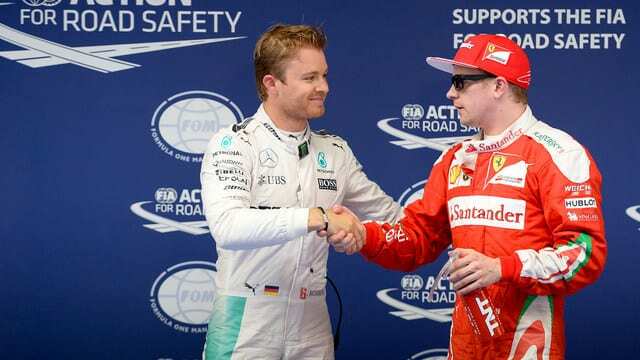 The fight for pole position was very tight, with Kimi Räikkönen having the edge initially. Rosberg improved to P1, with Daniel Ricciardo impressively moving up to P2, taking up a space on the front row of the grid. The two Ferrari drivers secured the second row with Kimi just ahead of Vettel.